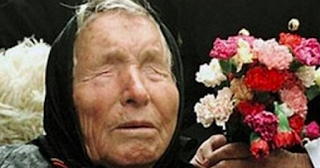 Baba Vanga, a mystic who many believe 'predicted' 9/11 and the rise of ISIS, also had two predictions for 2018. The 85-year-old passed away in 1996 but her predictions are still circulating online over twenty years later. Regarding the year ahead, Baba Vanga said that China would take over from the United States as the world's number one superpower. She also predicted that scientists would discover 'a new form of energy' on the planet Venus. In previous years, it has been suggested that China could potentially overtake the US as the number one global power and considering its current economic prowess, this is a definite possibility. As regards the second prophecy, the 'new form of energy', a NASA spacecraft entitled the Parker Solar Probe will launch in July. According to The Mirror, it is not expected to land on Venus but will use the planet's 'gravitational force' to study the outer corona of the sun. Baba Vanga, originally from Bulgaria, is often referred to as 'Nostradamus from the Balkans' and many believe she predicted many of the world's natural disaster and memorable events. She is thought to have predicted 9/11, the chilling rise of terrorist group ISIS, President Obama's run in office and Brexit but of course, people are divided about whether Baba's predictions are as authentic as they appear.